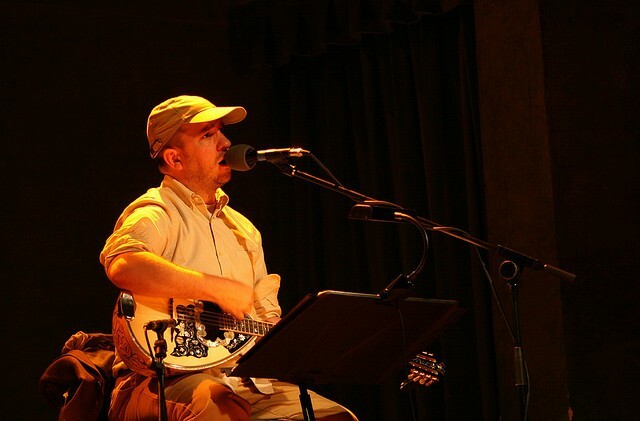 There are still tickets left for tonight’s Magnetic Fields show at the Vic, the second of a two-night run. Last night’s concert, while more subdued and slightly less fantastic than the show I caught at the Harris Theater two years ago, was still fantastic—as Joshua Klein points out in the Trib today, there's not much distance between songwriter Stephin Merritt's best songs (which are sublime) and his worst. Merritt’s traveling with the usual crew: bandleader and pianist Claudia Gonson, singer Shirley Simms (on ukulele this time round), Sam Davol on cello, and John Woo on guitar. The band’s also traveling, Merritt mentioned in last week’s Artist on Artist, with Gonson’s baby, who did not make an appearance. Last night they leaned heavily on 69 Love Songs material—“Come Back From San Francisco,” “Reno Dakota,” “Boa Constrictor,” “A Chicken With Its Head Cut Off,” and, happily, “The Book of Love” and “Busby Berkeley Dreams.” The first set closed with a song by the Gothic Archies, one of Merritt’s other projects: Merritt, sort of a notorious crank, seemed to be making fun of his own tendency toward the dark and fucked-up by ending with “Smile! No One Cares How You Feel,” a song whose closing line is “Everyone you despise will die, so smile.” Earlier in the show there were a couple songs from the Magnetic Fields’ most recent album, Love at the Bottom of the Sea, but for me the standout was an oldie: “Plant White Roses,” a devastating country lament with a chorus in perfect three-part harmony. One of the great unsurprising pleasures of the Magnetic Fields is that whatever odd and/or almost-too-precious things they get up to musically—not even to say lyrically—the band can also effortlessly turn out a song in the most traditional of forms and totally slay it. I was thrilled when Gonson mentioned that Kelly Hogan will cover the song on her forthcoming album, I Like to Keep Myself in Pain; Hogan opens for the band tonight.